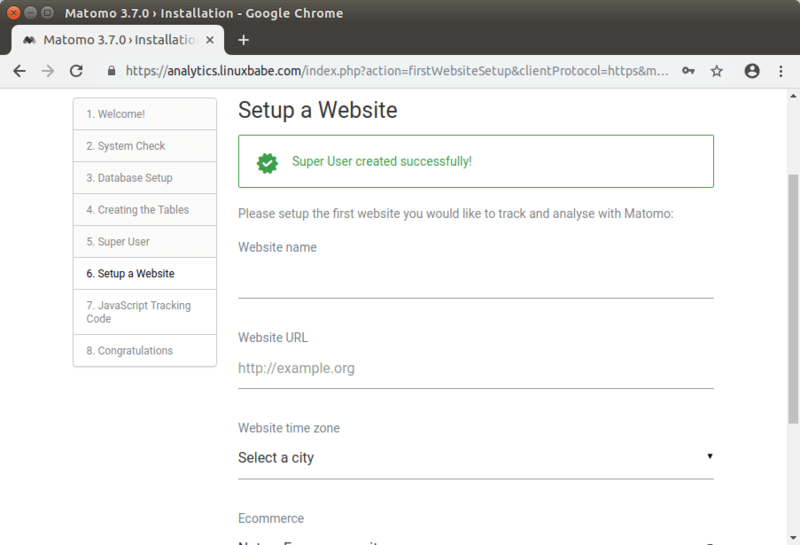 This tutorial will be showing you how to install Matomo web analytics (formerly known as Piwik) on Ubuntu 18.04 with Apache or Nginx web server. Matomo is an open-source alternative to Google analytics, which is the most widely-used web analytics software. Web analytics software are used by websites to know how many visitors are on a site in a day/week/month, what web browser they are using, etc. It is a crucial piece of software to help grow their websites. Google analytics is great, but the data of website visitors are stored on Google’s server. If you don’t want to share your website visitors’ data to a third party, you can run your own web analytics. 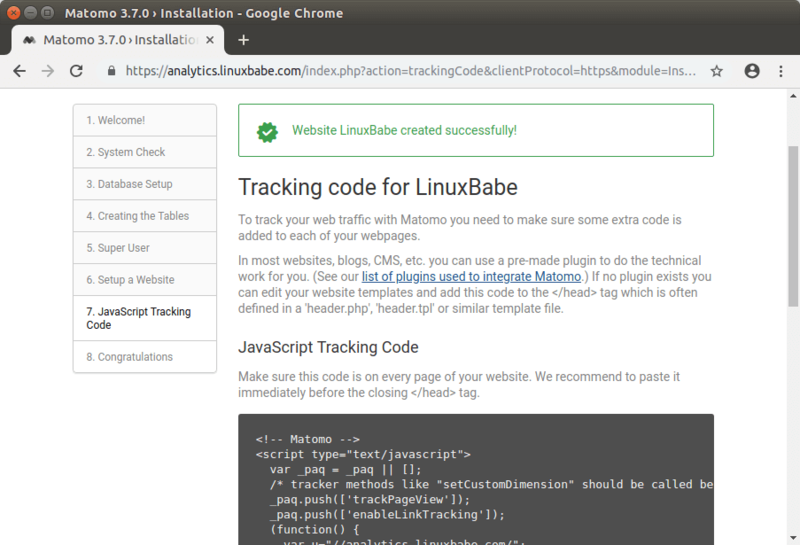 They are many self-hosted alternatives to Google analytics and Matomo is a great one. The open-source (GPL v3+ licensed) self-hosted Matomo edition can show the following reports. Top keywords and search engines, websites, social media websites. Classified into four main analytics report categories – Visitors, Actions, Referrers, Goals/Ecommerce (30+ reports). For a full list of features, please check the Matomo features page. I particularly like the fact that Matomo can list all my web pages by page views and show bounce rate and exit rate for each web page. 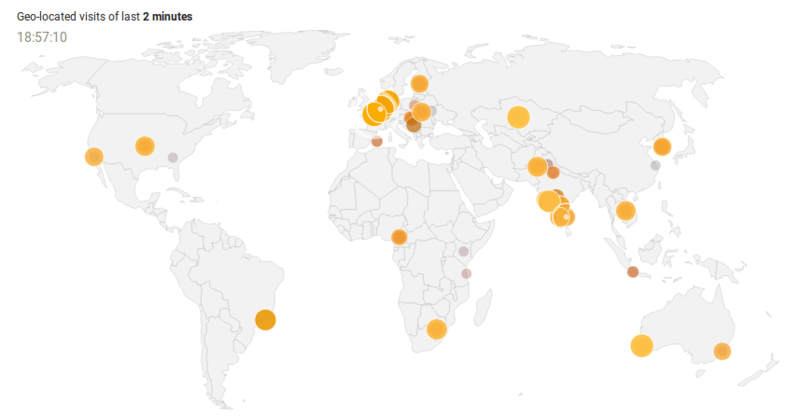 And also the real time visitor map. Full control of data. Data is stored on your server only and you can choose which country the server is located. No data limits. You can hold as many data as your server can. The cloud hosted Matomo has extra features, but you can install premium plugin on your self-hosted instance to gain the same functionality. To follow this tutorial, you will need a domain name and a server. I registered my domain name at NameCheap because the price is low and they give whois privacy protection free for life. A server with 512MB RAM is enough to run Matomo and here are the hosting providers that I recommend. I have used all of them. Once you have a server, install Ubuntu on them and follow the instructions below. When you are finished setting up LAMP or LEMP stack, come back here and read on. Log in to your server via SSH. You can always use the following command to download the latest version of Matomo on your server. At the time of this writing, the latest version if Matomo 3.7, which comes with a new feature – tag manager. It’s one of the biggest milestones for Matomo in the last few years. Once downloaded, extract the archive with unzip. The -d option specifies the target directory. Matomo web files will be extracted to /var/www/matomo/. Then we need to change the owner of this directory to www-data so that the web server (Nginx) can write to this directory. Log into MariaDB database server with the following command. Since MariaDB is now using unix_socket plugin to authentication user login, there’s no need to enter MariaDB root password. We just need to prefix the mysql command with sudo. Alternatively, you can also use this command to login. Then create a database for Matomo. 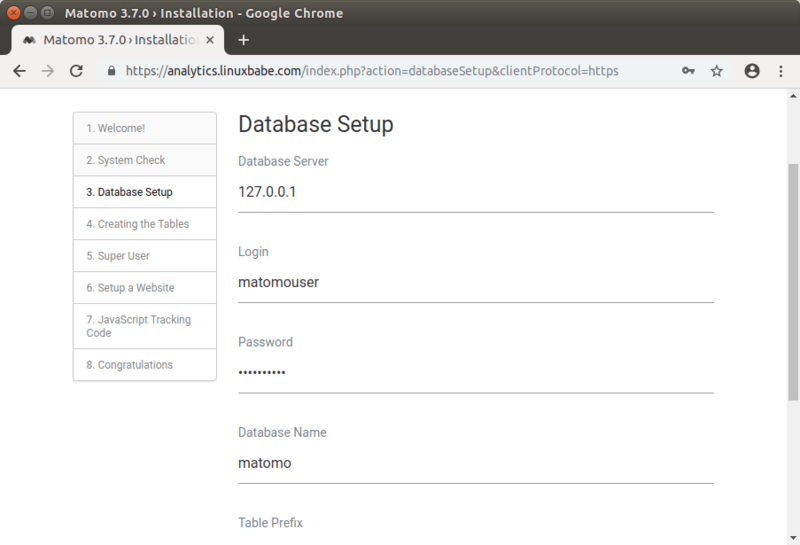 This tutorial name the database matomo. You can use whatever name you like. Create the database user. Again, you can use your preferred name for this user. Replace your-password with your preferred password. Grant this user all privileges on the matomo database. If you prefer to use Apache web server, then create a virtual host configuration file in /etc/apache2/sites-available/ directory. Put the following text into the file. Replace the red-colored text with your actual data. Don’t forget to set A record for the domain name. Save and close the file. Then enable this virtual host. Reload Apache web server for the change to take effect. If you prefer to use Nginx web server, then create a matomo.conf file in /etc/nginx/conf.d/ directory. Save and close the file. Test Nginx configuration, then reload Nginx for the changes to take effect. Run the following commands to install PHP modules required or recommended by Matomo. If you are using Apache web server, you need to reload it to make it run with these PHP modules. Nginx users don’t need to reload. Now you should be able to visit the Matomo web-based install wizard at http://analytics.example.com, but before entering any information, let’s enable HTTPS. To encrypt the HTTP traffic when you visit the Matomo web interface, we can enable HTTPS by installing a free TLS certificate issued from Let’s Encrypt. Run the following commands to install Let’s Encrypt client (certbot) on Ubuntu 18.04. If you use Nginx, you also need to install the Certbot Nginx plugin. Then run the following command to obtain and install TLS certificate. If you use Apache, you also need to install the Certbot Apache plugin. Then run this command to obtain and install TLS certificate. --nginx: Use the nginx plugin. --apache: Use the Apache plugin. --agree-tos: Agree to terms of service. --redirect: Force HTTPS by 301 redirect. --hsts: Add the Strict-Transport-Security header to every HTTP response. Forcing browser to always use TLS for the domain. 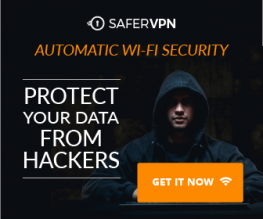 Defends against SSL/TLS Stripping. --staple-ocsp: Enables OCSP Stapling. A valid OCSP response is stapled to the certificate that the server offers during TLS. The certificate should now be obtained and automatically installed. 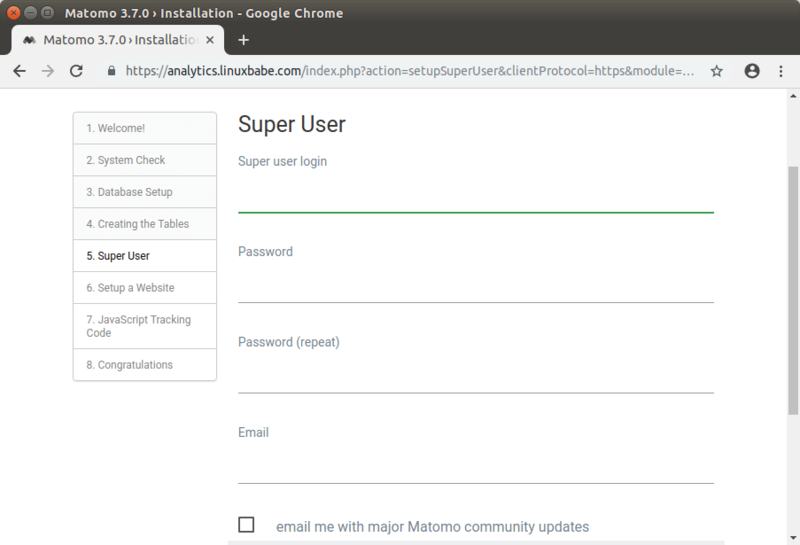 Go to https://analytics.example.com to launch the web-based install wizard. Then click Next button. 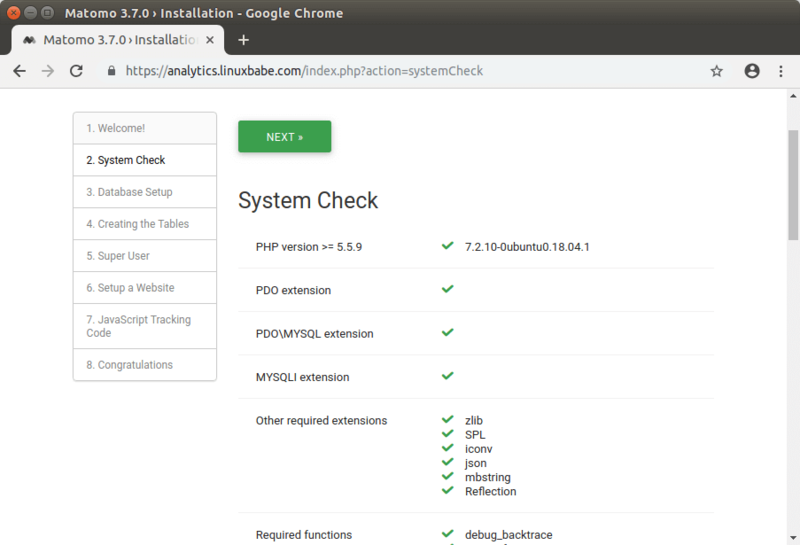 It will check if your system meets the requirements like PHP extensions. If all requirements are met, then click Next. In the next step, enter the MariaDB username, password and database name your created earlier. You can use the default value in other fields. 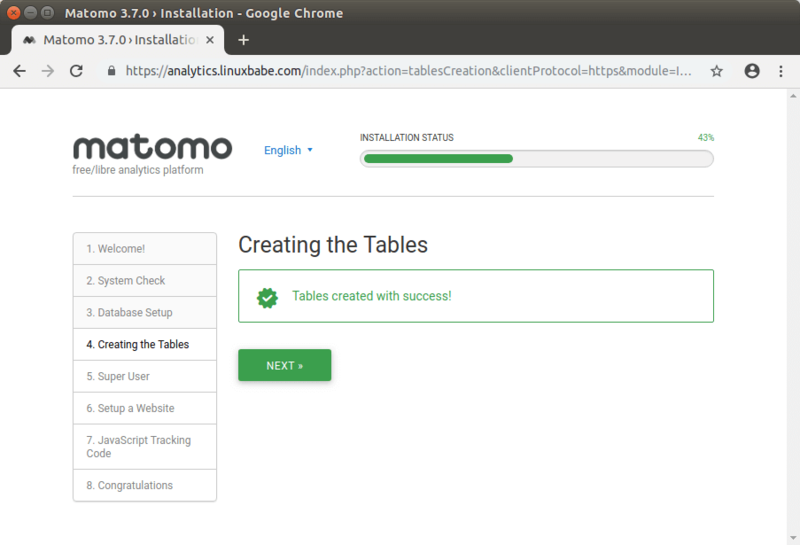 After clicking Next, the install wizard will automatically create some tables in the database. Click Next to continue. In the next screen, create an admin user for the Matomo web interface. After creating the admin user, you need to add a website to collect analytics data. Once that’s done. Click Next button and your Matomo installation is complete. Now you can log into the Matomo dashboard and view visitor data. If your website has thousands of page views per day, it’s necessary to set up a cron job to auto-archive Matomo reports. Create the Cron job file with the following command. Then add the following lines to the file. Standard output will be sent to /dev/null and standard error will be sent to your email address. Save and close the file. This Cron job will run every hour at 5 minutes past. If you don’t want to run your own email server, you can set up SMTP relay instead. Please see the following tutorial. By default, Matomo guesses visitors’ location based on the language they use. This is not accurate. For example, many non-US visitors choose En-US as the default language for their OS, so there will be more “US visitors” in Matomo report. To get better geolocation, click the cog icon (Administration) in Matomo, go to System -> Geolocation. Then download the latest Maxmind GeoIP database to your server. The tarball will be extracted to a directory named like this GeoLite2-City_20190226. Then move the GeoLite2-City.mmdb file to the /var/www/matomo/misc/ directory. Click the Save button to save your settings. 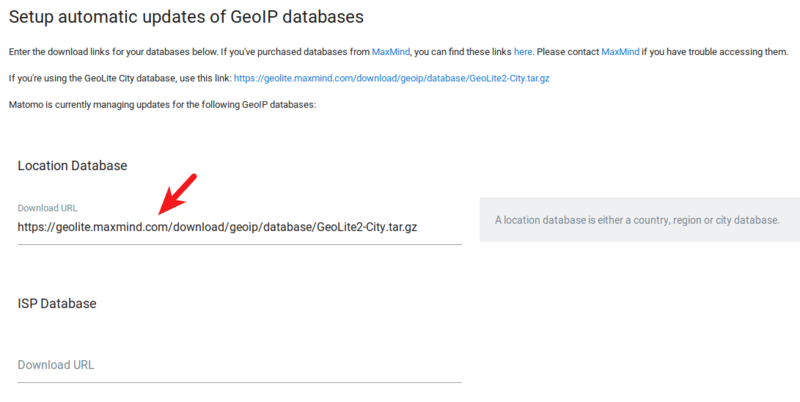 On the lower part of this page, you can also enter the Download URL so that Matomo can automatically update the GeoIP database. Subscribe to the Matomo changelog RSS feed to be notified when a new version comes out. Check the Matomo security tips. Read the Matomo performance tuning tips. Hey, I appreciate your site very much. It’s a frequent resource for me, thank you! I have setup Matomo on an additional server, separate from my website. Both are running nginx. Could you provide direction on how to reverse proxy from the primary web server to my Matomo server, with https through Let’s Encrypt? If you had a full article on reverse proxy with nginx/Let’s Encrypt you would be a god send haha. I’m always combining and trying new services and I feel like the reverse proxy process is very convoluted. I feel like there is very little reliable documentation out there.